The maker education movement has sparked a minor revolution in K–12 STEAM education. A growing number of schools and entire districts across the country are implementing dedicated, in-school makerspaces — sometimes called STEAM labs or fab labs — where students are encouraged to experiment, invent and tinker with a range of materials and technologies. But what constitutes an effective in-school makerspace? "A makerspace is more of a mindset than a toolset," said Casey Shea, curriculum coordinator for maker education for the Sonoma County Office of Education (SCOE). "Many of the most successful makerspaces I've seen started with very little equipment and a lot of creativity. It's a fundamental mistake to think that dropping a 3D printer into a room will turn it into a makerspace." Shea has been involved with the maker education movement almost from its inception. He was teaching math at Analy High School in Sebastapol, CA, north of San Francisco, during the 2011-2012 school year when Dale Dougherty, the publisher of Make Magazine and founder of the Maker Faire, approached him about an experimental maker education project. Shea ended up leading a class of about 30 young makers, who met at the magazine's nearby headquarters twice a week. Students engage in activities ranging from 3D printing to sewing in the makerspace at Analy High School. 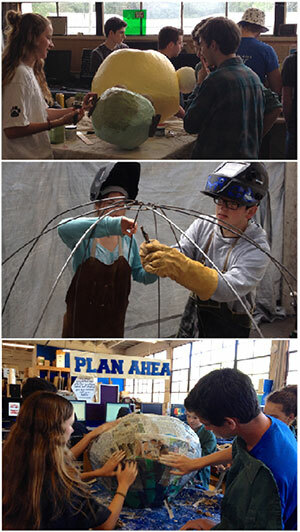 Analy's Project Make is now taught on campus and includes three sections open to 9th–12th graders. The program has emerged as something of a model for hands-on learning. In fact, Shea worked with educators at Sonoma State University to develop a 50-hour, first-of-its-kind Maker Certificate Program, designed for people seeking to lead maker activities in schools, clubs, community centers, libraries and other organizations. In his new role — he was appointed in July 2016 — Shea helps educators throughout the county establish and expand "making opportunities" in their schools and classrooms. He said he believes that "making and tinkering" and the philosophies behind those activities are an essential part of the formula for a true 21st century education. "Making is definitely not a fad. One of the secrets to providing students with an effective in-school makerspace lies in keeping its fundamental purpose in mind, Shea said. "A successful in-school makerspace provides kids with a variety of tools and materials and the freedom to create," he said. "It's really that simple — and that challenging. There's a lot of great technology out there finding its way into these spaces — laser cutters, 3D printers, robotics technologies and all kinds of computing components. But honestly, it doesn't have to be equipped with high-tech digital manufacturing tools to be an effective makerspace; it can be stocked with glue guns and cardboard if students are engaged and using their hands and minds to create and solve problems." Analy High's in-school makerspace is a converted shop-class building with a concrete floor. It's equipped with a laser engraver and a vinyl cutter, among other high-tech equipment, as well as tools for wood and metal working. The space, which is also used to host classes for non-student members of the community, is well organized with labeled shelves and areas sectioned off for different types of projects. "The shop classes I took in a space like this were, more often than not, about following a set of plans, and you were assessed on how well you followed those plans," Shea said. "There was a time when that approach made sense. But that's not what this space is about today." A makerspace can be a combination of woodshop, computer lab and art studio, so the space has to be flexible, Shea said. "When things are cooking in a makerspace, you might have 15 to 20 very different projects going at one time," he said. "Students occupying the same space might be building everything from micro-controlled robots to hardwood furniture, drones to squishy circuits made with conductive Play-Doh. A lot depends on what materials and tools are available at the school. There's a random element to all this; a local business might contribute some lumber or some Arduino microcontrollers. And things get repaired and repurposed in this environment. A successful makerspace has the flexibility to accommodate all this." As an example of an in-school makerspace designed from the ground up, Shea points to Lane Tech College Preparatory High School in Chicago. It's an environment rarely seen in high schools, where space repurposing is the norm. The Lane Tech Innovation and Creation Lab is clean and open, and it's equipped with four Epilog laser cutters, 10 MakerBot and UP! 3D printers, six ShapeOko2 CNC mills, four Silhouette Cameo vinyl cutters, four MakerBot 3D Scanners, 30 MacBook Pro Retina laptops, two 15-foot wall projectors, a mobile Smart Board, multiple custom-designed workspaces with power drops, collaboration spaces with HDTV and laptop HDMI switching, a large variety of production and prototyping materials and "a variety of power and hand tools." Of course, an in-school makerspace doesn't have to be purpose-built to be effective. Nor does it have to be a place where woodchips are flying at one end while circuits are being soldered at the other. Traditional libraries, for example, are being used to implement maker education in a number of K–12 districts. The Castle Rock Middle School library, for example, is one of a number of school libraries in Colorado's Douglas County School District redesigned to accommodate a makerspace. Called a Learning Commons, the space exists within the library, surrounded by shelves of books, and the maker classes are actually supported by the librarians. Curved tables encourage collaboration among the young students, who also have access to a 3D printer and lots of laptop computers. An estimated 50 libraries in the district have made, or are making, this change. 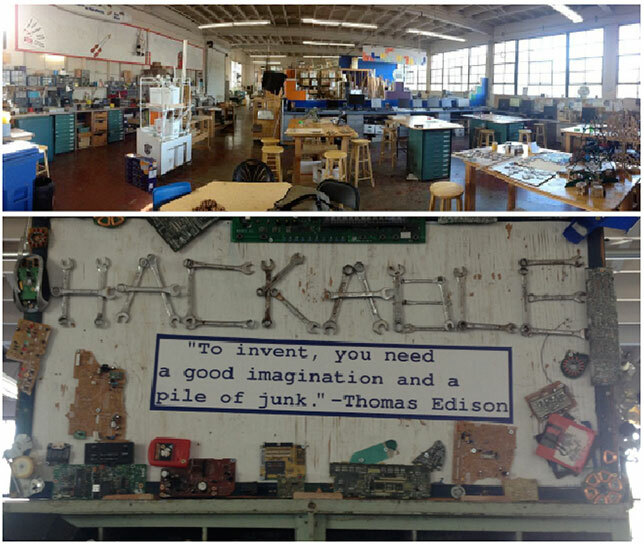 A section of the expansive makerspace at Analy High School in Sebastapol, CA. "Now [the library] is a place where kids whose talents haven't been tapped into before have a place to call home," said Castle Rock librarian Yvonne Miller in a promotional video. "While still fostering a love of reading and books and something that I, myself, love, it has something more, too. It's joyful, and it's noisy, and it's full of love and laughter and light and kids who are experimenting and playful with their learning." In the Brevard County Public School District in Florida, existing library media centers have been repurposed as 21st century makerspaces, which the district is calling Innovation Centers. The spaces are organized to support things like computer coding and robotics, 3D printing, electronics and circuits, building and construction and even "consumables." Even with a grant from Northrup Grumman to launch a pilot Innovation Center project in six schools, the budget was tight, said Technology Integrator Pam Aulakh and Library Media Resource teacher Gina Clark in a blog post. The space was furnished with inexpensive, adjustable tables with whiteboards on top. "We picked simple chairs in bright colors to make the space more inviting and lively," they said. They also purchased three daVinci Jr 3D printers and a variety of mobile devices for each space, and a 70-inch Promethean ActivPanel for each of the Innovation Centers. "These panels help students to collaborate on projects, 3D modeling and communication," they said. There's no single way to design a great in-school makerspace, Shea said, but if there is a common element among spaces that truly foster the maker mentality, it's that collaboration piece. "You don't want to feel like you're working alone in your garage," he said. "In a well designed space, I can look over somebody's shoulder to see what they're working on, and that might trigger something that fits into something I'm working on or thinking about. The space shouldn't be like a secret R&D lab. It's more like an ongoing, transparent beta test. Open and messy is better."